Here’s an article from the BBC about the so-called “Birthday Paradox” applied to the teams of the 2014 FIFA World Cup. The Birthday Paradox is the term for a common failure of intuition. It’s rather unlikely for two people to share a birthday, and people usually expect it to remain unlikely for any two people in a group of moderate size to share a birthday. In fact, the number of pairs of people grows quadratically, so the probability that there is at least one pair sharing a birthday hits 50% more quickly than people often assume. It turns out that the tipping point for the size of the group is 23, which is exactly the size of a World Cup soccer team roster. And the teams this year illustrate the balance perfectly: exactly half of them have players that share a birthday. As Ξ points out on the math blog 360, even though 50% is the proportion of teams we would expect to have birthday-sharing-players, it’s actually pretty unexpected to hit the expected value exactly. That might be a “Birthday Paradox” Paradox. But not the one that I set out to write about! Situations like the Birthday Paradox can come up in all sorts of contexts. Four years ago I noticed an interesting fact: all of the groups in the first round of the 2010 World Cup had different score results. This seemed unlikely to me, but was it really? I’d need to do some more investigation to find out. 2010 was indeed the first time that all of the scores had been different since the World Cup expanded to eight groups in 1998, but there had only been a total of four World Cups to that point, not enough for a good statistical sample. You can model group results with with oriented graphs: directed edges correspond here to a victory for the team that the edge points away from, and absent edges stand for ties. 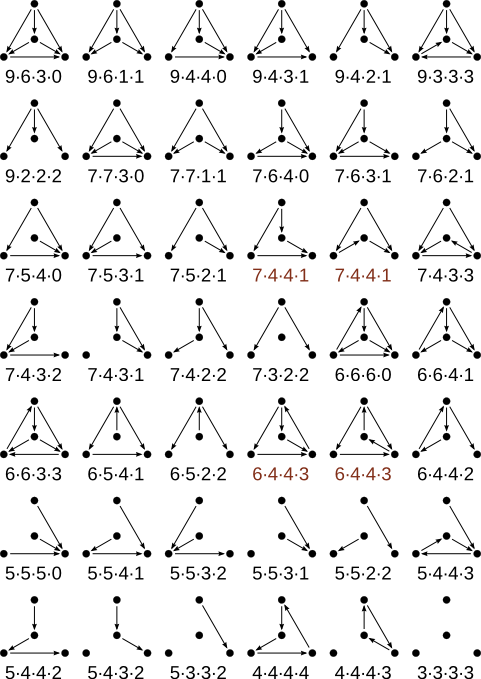 There are 42 distinct oriented graphs with four vertices, but only 40 different group scores; in two cases the same score can be achieved with two different graphs. For the sake of mathematical simplicity, let us assume that every game that is played has an equal probability of being a tie, a win for team A, or a win for team B. This makes the problem easier to model at the expense of some realism. In the real World Cup, there are better teams and worse teams, and the teams are seeded into groups such that there is approximately one team belonging to each quartile in each group. (Concerns like geographical distribution may interfere with this ideal.) This means that results with cycles of victories are probably a little less likely in the real world than in our model, as they would require a team that is worse on paper to defeat one that is better. Upsets do happen, but their unlikelihood is what makes them upsets. Additionally, the actual proportion of ties may diverge from 1/3, although this is not in fact a terrible estimate. In 2010, 14 of the 48 group matches were draws. Complicating matters, the graphs are not equally likely to appear. Notice that a graph with no symmetry (such as the 9-6-3-0 graph in the upper left corner) can occur in in as many ways as there are permutations of the four teams. (There are 24.) At the other extreme, the most symmetrical graph belongs to the group with all ties in the lower right, which can occur in exactly one way. In general, the graphs with more symmetry can be made in a smaller number of different ways. Counting the scores that can be achieved with two graphs, there are 2 scores that can be reached 36 ways, 21 that can be reached 24 ways, 9 that can be reached 12 ways, 3 that can be reached 8 ways, 2 that can be reached 6 ways, 2 that can be reached 4 ways, and 1 that can be reached 1 way. We can check that we’ve got them all by noting that this adds up to 729, or 36, which is the number of different ways six games can go. I wrote a Python program that found the above counts and then used them to determine the probability that no two groups would have the same score in our model. But before I did that, I wrote another program to simulate the results of a group stage by randomly picking the results of each game. Even though this simulation couldn’t give an exact answer to the problem, I’m glad I wrote it. It was a much simpler program than the one I wrote to get the exact answer, so it was easier to convince myself that it was performing correctly. In the process of writing the final program, I made a number of mathematical and programming errors that led to incorrect results; if I did not have a good idea of the approximate value of the answer, I might have stopped without knowing there was an error. The end result? The probability of all eight groups having different scores in my model is 393101879398962298880/984770902183611232881, or about .39918. So I was right that all groups having different scores was the less likely case, but wrong to think that it was particularly unlikely. I think a big part of why I was wrong was that I knew about the Birthday Paradox. It primed me to think that no two items in a group sharing a property would be unlikely, in a more general sense than is actually the case. This is the “Birthday Paradox” Paradox that I fell into. What proportion of ties would maximize the probability that all group scores are different? We might explore the probability of all group scores being different in various past and hypothetical tournament setups. What if there were more or fewer groups? What if wins counted for two points, as was once the case? What if there were five teams per group? In the cases with four teams per group where there are two different graphs that give the same score, the sets of team records are the same. (For example, in the 7-4-4-1 groups, the records are set of team records for both (expressed as wins-losses-ties) are 2-0-1, 1-1-1, 1-1-1, and 0-2-1.) With 5 or 6 teams, is it possible to come up with a group score that can be formed by two different sets of team records?